Pass beyond the cozy vestibule and through the heavily courtained entrance of Washington's top Zagat-rated restaurant, and you're instantly at ease. The light is gently dimmed, the colors are warm and soft, the fleur-de-lis and chanticleeer motifs set the scene firmly in France; you are welcomed by the caring and practiced staff. The overall impression is calm, elegant, and comfortable. It is a place that makes you happy to linger. 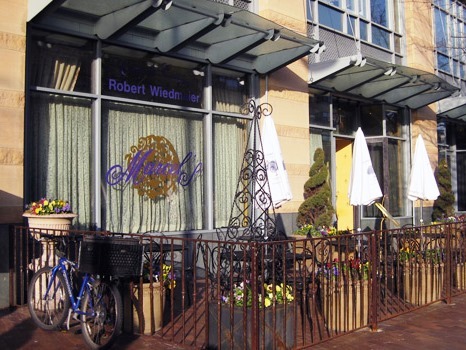 Chef Robert Wiedmaier's elegant French fare offers subtle hints of his Belgian background with a cuisine that is neither too refined or too fusy, but is both welcoming and elegant. Marcel's welcomes groups ranging from 10 to 120 persons for seated occassions and up to 200 for standing receptions. Tucked behind rich velvet curtains, the Palladin Room can accommodate groups as small as 15 and up to 60, while larger groups can enjoy use of the entire restaurant. An outdoor patio and wine bar allow groups to mingle before and after events, whether enjoying a cordial outside or listening to the pianist tickle the ivories. A variety of menu options range from passed hors d'oeuvres to Marcel's signature dishes served in the seven course chef 's tasting menu offer flexibility and customization according to a group's preferences.